Home page > News > Once more about industrial heating. Once more about industrial heating. In Ukraine, forced-air heating of industrial facilities has been very popular since the 70s, and it still can be found in many factories. However, as with any technology, heating systems were improved to consistently follow the main law of the economy - to achieve the best result at the lowest cost. After 45 years we can say that heating of industrial premises with modern systems has become simpler, "flexible" for the various conditions of use and, of course, more efficient. Radiant heating stood out sharply against the background as an alternative to forced-air heating. 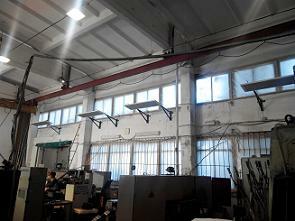 Previously, it was used mainly for local heating or as an additional heat source, but now, in spite of the features of industrial premises, radiant heating is capable of operating as a primary heating system. Heating of industrial facilities actually has a number of features that can't be ignored when it comes to choosing a heating system. Of course, the first thing that all the experts point out is nonstandard dimensions of shops, hangars, warehouses, etc. Indeed, there is an ordinal response between the heating system capacity and the area of heating, and this will not go away. It is also often necessary to additionally take into account the complexity of the building structure, especially if you want to evenly heat the entire room, but the building itself at the same time may have different ceiling height, non-insulated walls, etc. Heating of industrial premises is particular by the fact that the number of jobs that can be carried out there or the very nature of the industrial facilities inevitably require special attention for the presence of hazardous materials, safety and so on. Self-contained heating of industrial facilities with the help of the infrared system solves the two main problems of air heating. Let's name them: 1. The low level of energy efficiency. 2. High thermal inertia. Note that when using forced-air heating the average level of temperature changes by 1-1.5 degrees with every meter. In conjunction with the known physical fact that warm air always rises up since it is lighter than cold air, it leads to the fact that forced-air heating of industrial facilities heats the upper part of the building. This completely contradicts the need to heat the workplaces and equipment, which usually occupy no more than 2-3 meters of space above the floor. Infrared heaters, at that, are mounted on the wall or ceiling and give off their heat through infrared rays directly to objects that fall within the radius of their reach. With all this going on the building retains 80% of the heat, which is accumulated on the solid surfaces, when only 20% goes directly to the air. Thus, industrial electric heating helps to save up to 50% of the resources, but the infra-red heating system efficiency is 98% - the best performance among all types of equipment. 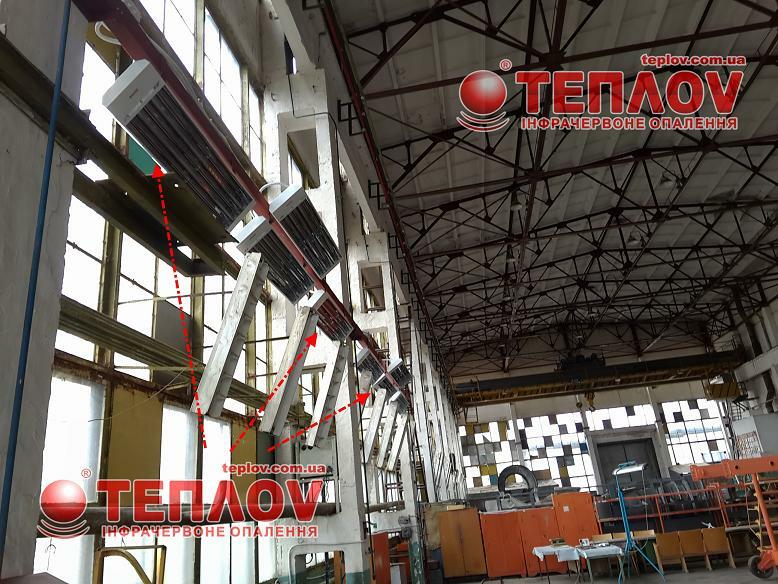 As for high thermal inertia - in the case of forced-air heating it is necessary to constantly maintain the heating process, otherwise, the system and the room rapidly cool down, and the subsequent activation requires even more energy to start and warm-up the system. Infrared heaters, in their turn, have a low level of thermal inertia, which allows users without additional energy costs to adjust the time of power control, high-intensity mode, etc. Regular and automatic system shutdown when the temperature in the room reaches the required level, allows to avoid unnecessary energy expenditure and to maximize savings. Electrical heating is presently helping many enterprises to create economical and efficient heating systems. 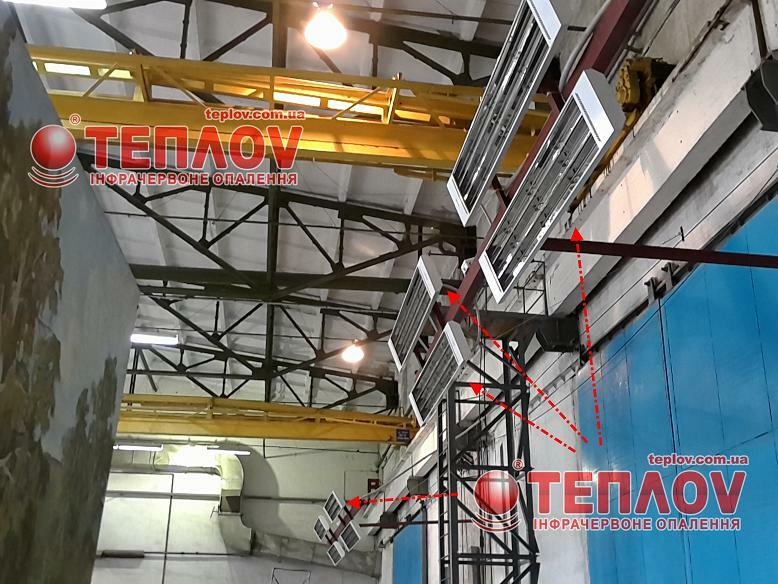 A striking example of that is the use of Teplov U6000 infrared heaters at the state enterprise Nikolaev Aircraft Repair Plant "NARP". This production being a part of the State Concern "UkrOboronProm" is engaged in the repair of aircraft, engines, auxiliaries and other things. The specifics of the enterprise implies the existence of large hangars for aircraft and other equipment subject to repair. Accordingly, heating of production facilities requires a maximum focus on workplace heating in order to provide a comfortable and safe operation. Specialists in the infrared heating system pioneered the use of the method that exploits infrared heaters in a way that creates the effect of thermal guns. Teplov U6000 infrared heaters were fixed on the perimeter of the room in a row, creating a powerful thermal circuit and preventing the ingress of cold air from the outside. Such infrared heating can be used as a powerful source of heat for local heating by installing a heater in a certain area and connecting it to a separate thermoregulator. 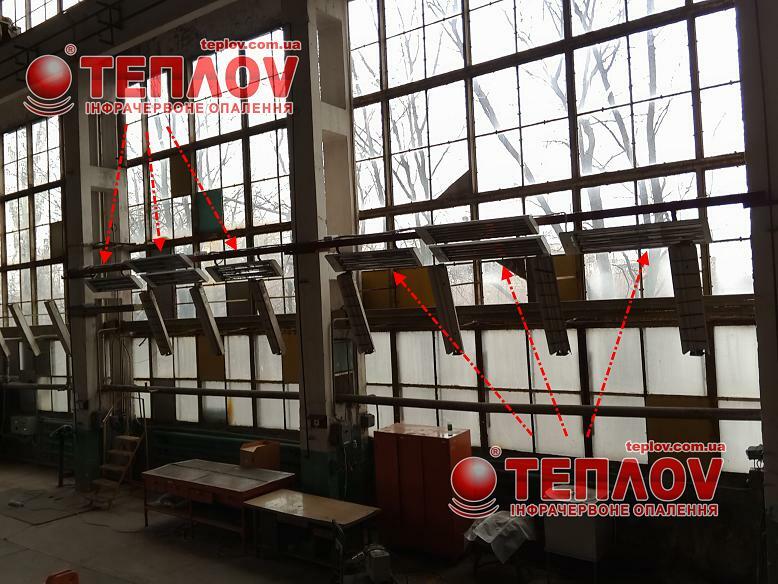 Thus, heating of industrial facilities with the help of infrared heating - is a flexible system, which is devoid of the disadvantages of forced-air heating and has high rates of economy and efficiency.